No you can have a helicopter to fly around with and take pictures and video that you can then share with the world. 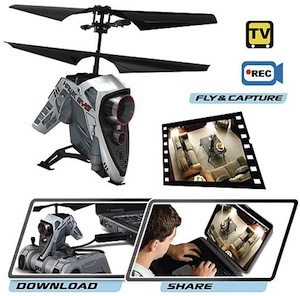 This remote controlled helicopter will do that for you and while you connect it to you pc and mac with the USB cord it will also charge it self in the meantime so that you can start flying again before you know it. If you want some great video from above this is the way to do it easy and fun. Go check out this Air Hogs Hawk Eye RC Helicopter. Now you can shoot video of you friends when they don’t expect it. This little fellow shoots 640 x 480 video in avi format great for putting on youtube and great for pranks. The 4GB internal memory is good for around 4 hours of video and the rechargeable battery makes it easy to get it ready for use. Go check out the Spycam Car key Fob Camera and see a video made with this little camera.